In 1938, developer Harvey D. Gibson rented a rope tow from ski shop founder Carroll P. Reed and moved it to Cranmore Mountain. This was the humble beginnings of what would become a booming ski industry in North Conway, New Hampshire. Snow trains of the 1930s would transport skiers and snowsport enthusiasts to this idyllic winter playground nestled in the White Mountains. Cranmore has been home to numerous ski legends, including Austrian ski great Hannes Schneider, renowned as the "Father of Modern Skiing"; his son, U.S. Ski Hall of Famer Herbert Schneider; and Toni Matt, winner of the 1939 Mount Washington Inferno. 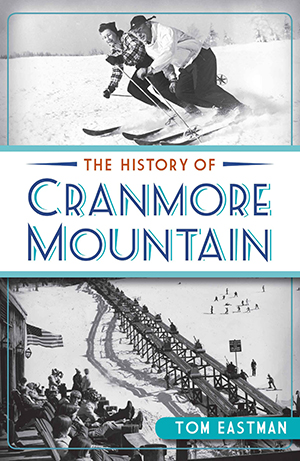 Join author Tom Eastman as he takes on the history of the snowy trails of the Cranmore Mountain Resort. Tom Eastman is a journalist for The Conway Daily Sun. He won an Excellence in Newspaper Features Writing Award for 2009-2010 from the North American Snowsports Journalists Association. He was named Ski NH's Media Person of the Year in 2001. Tom frequently lectures on local ski history both in the United States and abroad.